Materialise stock has been on a roller-coaster ride: It just plunged 13.4% Thursday. However, shares of the Belgian-based provider of 3D printing software and services have declined 5.3% so far this month, through Thursday, Jan. 10. They had been continuing their positive momentum this month until Thursday, when -- BAM! -- they plunged more than 25% in early trading before recovering about half their losses and closing the day down 13.4%. For context, the S&P 500 declined 9% last month and has returned 3.6% so far this month. 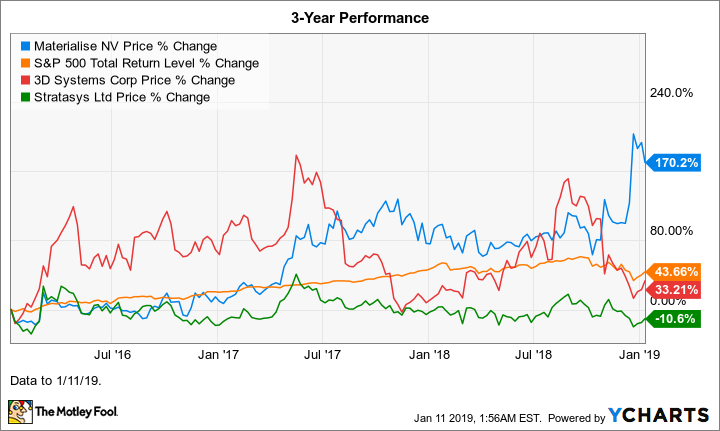 Shares of the two big 3D printing players, 3D Systems and Stratasys, dropped 17.9% and 15.8%, respectively, in December, and are up 9.6% and 8.1% so far in January. 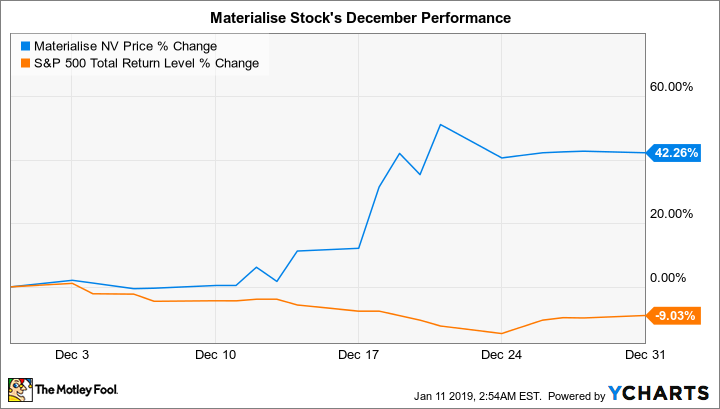 As for December's big pop, Materialise didn't release any material news last month, nor was any notable positive news reported about it. So we can't pinpoint the reason for the stock's big upward move. Chart should say "Data to 1/10/19." Data by YCharts. As for Thursday's big drop, it would seem that some profit-taking was at play, after the stock's huge run-up in December. While there are things to like about Materialise, for now, most investors should probably stay away from its stock until the volatility dust settles. More profit-taking could be coming.